Of course I had to meet a member of the same club as myself the first round. Not only was he better that me but also knew my playing style. My only hope was to surprise him somehow, but it did not work. Slowly he gained an advantage, eventually big enough to capitalise on. I lost the first round. This entry was posted in Chess, Norway and tagged Brokstad, chess tournament, Everton, trondheim on December 22, 2015 by Traveltorgeir. We had been looking for chess clubs in Japan to visit, and a few weeks before we left I found one in Osaka that had games every sunday. We had already planned to be in Osaka on sunday. We had a chance to play chess in Japan. 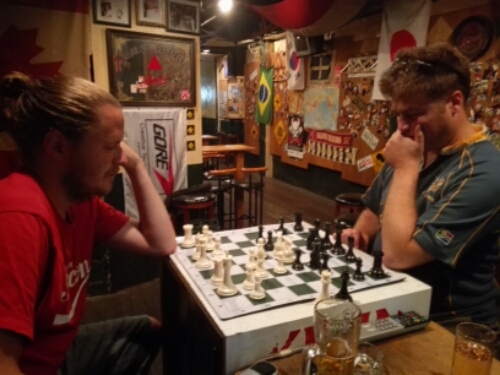 This entry was posted in Chess, Japan and tagged an pasan, chess, chess club, Osaka on September 8, 2015 by Traveltorgeir. I play a little chess myself, and when I read about the daily chess games between old men in Sarajevo, I knew I had to have a look. It wasn’t hard to find, I could hear loud discussions from far away. At first it was hard to tell who were playing and who only were watching. The spectators took an active involvement in the game, sometimes even stepping in and doing the moves for the players. Doing a bad move was certainly unacceptable and the player could quickly find himself overruled. 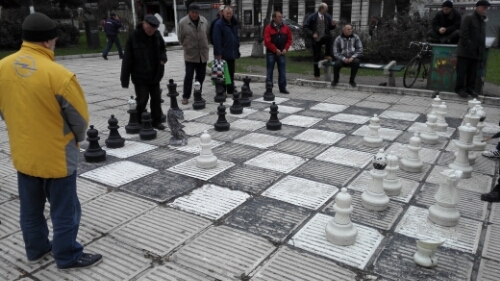 This entry was posted in Bosnia-Herzegovina, Chess and tagged Like a local, sarajevo on April 1, 2015 by Traveltorgeir.